TWO Cups Rice per 5people. – Put ONE handful EACH of Dehydrated White Onion and Bell Pepper. (Use FRESH if u have it) OR use 2 cups of Pace Picante Sauce (medium). – Dust (very thin layer) the top of the water with BEAZELL’s – then a layer of Paprika and then one tablespoon of Cayenne. – Add a “Layer” of Chicken Thighs. – Dust chicken with Beazells, Paprika and Garlic Salt. – Cover, Bring to boil, then reduce to Medium for approx 45mins until Chicken is cooked. – Remove Chicken from pot and let cool (until u can remove skin/fat and debone without burning your fingers) OR Skip this step by using Boneless/Skinless to begin with. – It is now time to start your RICE. – If you are health-conscience, it is now time to spoon out the Grease. But I leave it in because Pork/Chicken Fat RULES!! – Now we are at the Step of the Recipe where I “cheat” by using HUNT’s Garlic and Herb Pasta Sauce instead of making my own Tomato Sauce due to time-constraints. 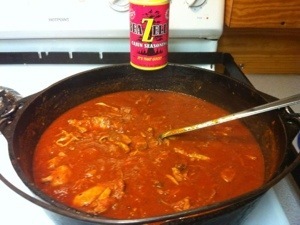 – I used THREE 24oz cans for this Recipe. Then tell your Crew to COME AND GET IT! !